It is going to be a busy Summer here at EMEC’s wave test site with 2 new deployments due shortly. 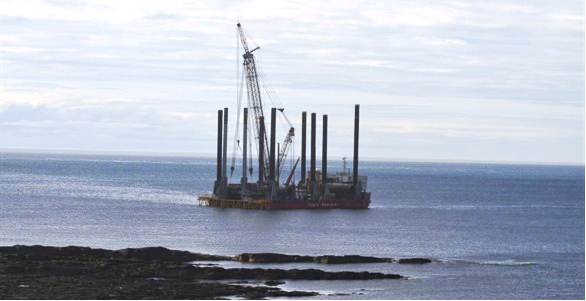 Aquamarine Power took the first steps towards installation of their second full-scale Oyster wave energy converter last week with the arrival of the ‘Excalibur’ jack-up barge in Orkney. The vessel is now stationed at Billia Croo (see picture), where Oyster will be installed later this summer. The jack-up barge will now begin drilling piles into the seabed to provide the foundation for the second generation device. The Oyster device is due to arrive in Orkney in late July. The device has been manufactured by Burntisland Fabrications at its Methil and Arnish yards. The fully-fabricated Oyster will be transported from Methil to EMEC by barge in July. The next phase of installation will see Oyster being fixed to the seabed piles around 500 metres from shore. This will be followed by a commissioning process which will see the device connected to an onshore hydro-electric generator via subsea pipelines. Onshore works have been underway at Billia Croo since October last year for the directional drilling of the subsea pipelines. Wello Oy’s Penguin wave energy device left the Riga Shipyard in Latvia last week and is on its way to Orkney ready to undertake testing at Billia Croo. The Penguin is being towed to Orkney by the MTS Victory and is expected to arrive in Lyness this week. The 1600-tonne Penguin device is around 30 metres long, nine metres in height and has a draft of around seven metres. As a result, only two metres are visible above the water surface. It is the product of a five-year development programme, which saw the size of prototype devices gradually increased until the current 500 kilowatt (kW) model which is to be tested at EMEC. The Penguin is designed to capture rotational energy generated by the movement of its asymmetrically shaped hull, which rolls, heaves and pitches with each passing wave. This motion is used to accelerate and maintain the revolutions of a spinning flywheel housed inside the hull, which in turn drives an electric generator to produce electricity that is then exported via a subsea cable.